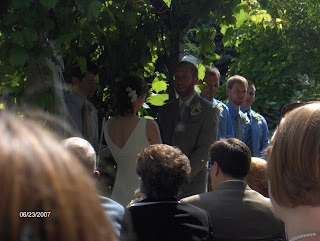 While visiting in MN we attended our friends' Liz and Tim's wedding. It was at a farm out in the country and was a blast. 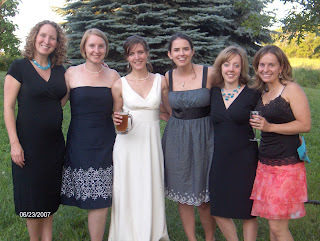 Liz and I were on the cross country ski team in high school and have been close friends ever since. Can't wait to visit her in her new home, Colorado. 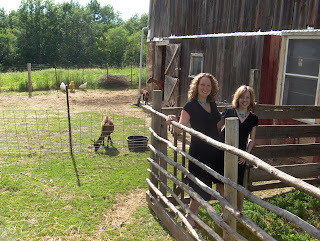 My best friend Rachel and I by the goat farm! We did not plan the matching dresses and necklaces - it was quite funny when we saw each other's outfit! I guess great minds think alike. Here are the ski girls, minus Em :( It was fun to see them - it has been years since I've seen some of them.